The Lucas Chair by Precedent comes dressed to impress with button back detailing that's crisp, clean and eye-catching contemporary. 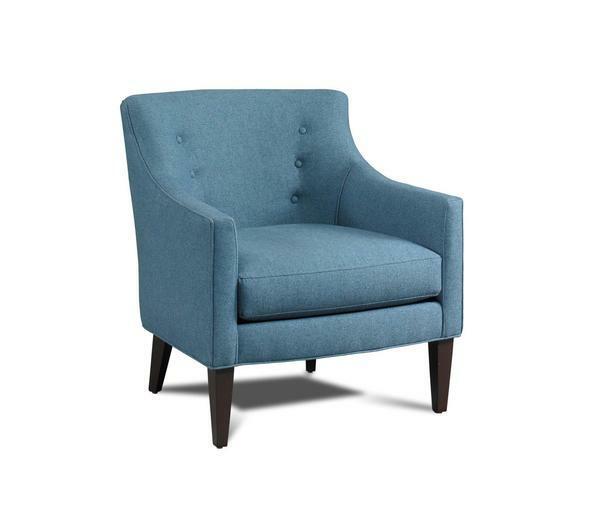 Adding an accent chair like this to your contemporary style living room enhances the decor as it brings a cozy seat for guests who prefer a chair seat to the couch. Lucas embraces the smooth form of the contemporary with perfect balance in each and every one of its subtle curves. The Lucas Chair by Precedent lets you to play with color, boost your living room decor and enjoy the finest in luxury seating. This living room furniture is crafted by Precedent, a company that's been crafting fine furniture for over 30 years. Precedent is American made furniture to feel good in and feel great about buying. With a commitment to fine style, maximum comfort and quality products, Precedent is a leader in timeless contemporary styles. Chair frame is made of certified kiln-dried hardwood, ensuring added strength and resistance to bending or warping. The frame is guaranteed for life to the original owner. You can customize the seat cushion for the Lucas Chair with two options available. Select cozy UD foam cushioning or a combination of foam and down. Upholstery options include your choice of Standard, Performance Plus or Specialty fabrics-feel free to order samples to work with at home.